What causes precipitation (rain and snow)? 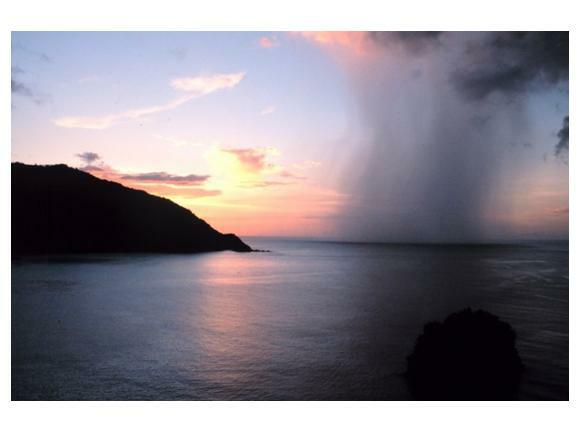 Precipitation forms when cloud droplets (or ice particles) in clouds grow and combine to become so large that their fall speed exceeds the updraft speed in the cloud, and they then fall out of the cloud. If these large water drops or ice particles do not re-evaporate as they fall farther below the cloud, they reach the ground as precipitation. 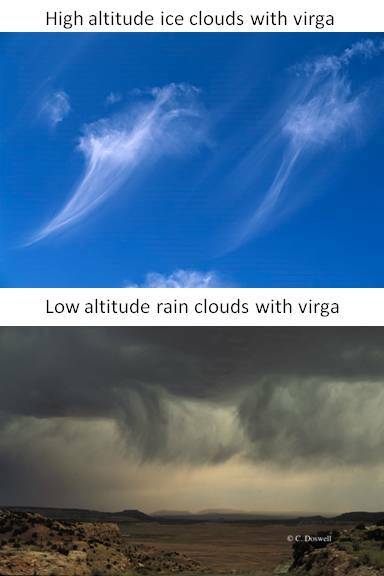 The more water vapor there is below the cloud, and the stronger the updrafts that cause this water vapor to condense into cloud water or ice particles, the more likely it is that precipitation will form within the cloud. So, a cloudy day with no precipitation indicates that there is either (1) not enough water vapor available to the cloud for precipitation to form, or (2) that the rising motion creating the cloud is not strong enough -- or both. At the opposite extreme is a tropical rain shower that has large amounts of water vapor available to it (like the one pictured at the top of this page), and which can rain heavily from even a small cloud with weak updrafts. In warm air masses, precipitation occurs primarily within localized shower clouds that have strong updrafts. In cooler airmasses, precipitation (rain or snow) usually occurs in large cloud systems associated with low pressure zones. These low pressure zones usually form along the boundary between warm and cold air masses, where the flow of air around the low pressure causes large areas of weak rising motion as air from the warmer air mass flows up and over the colder air mass. PRECIPITATION EQUALS EVAPORATION All of the precipitation that falls originated as water vapor that was evaporated from the surface of the Earth. It is always raining somewhere on the Earth, just as evaporation is always occurring over most of the Earth's surface. At any given time, precipitation covers only about 2% to 5% of the surface of the Earth, while evaporation is occurring over the remaining 95% to 98% of the Earth. Thus, as water vapor slowly evaporates over most of the Earth, an approximately equal amount gets "concentrated" into relatively small rain systems that turn some of the vapor into precipitation. So, averaged over the whole Earth over a period of months, the amount of precipitation almost exactly balances the amount of evaporation. If this were not so, the atmosphere would either be filling up with water vapor, or be depleted in water vapor.